Hobby Horse Zephyranna SwitchIt Blouse, Limited Edition. 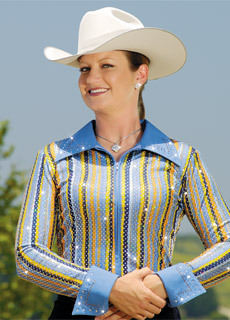 Glittered stretch fabric on a black base creates a stunning show blouse. Simply add the SwitchIt collar and cuffs for an interchangeable extra-fancy finishing touch to a great basic blouse. Zephyranna available in copper, purple or royal. Collar/cuffs sold separately. Poly/lycra, hand wash. Copyright Hobby Horse Clothing Co.
Don't forget the Collar & Cuffs at only $49. 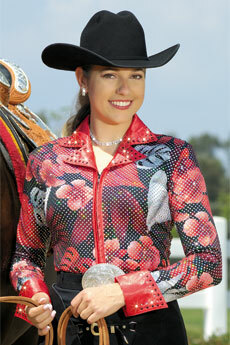 Hobby Horse Ribbons SwitchIt Blouse, Exclusive Limited Edition. Glittered stretch fabric on black base creates a stunning show blouse. Simply add the SwitchIt collar and cuffs for an interchangeable extra-fancy finishing touch to a great basic blouse. Choose Copper, Red or Royal hues on black. Collar zips at back. Collar & cuffs sold separately. Poly/lycra, hand wash. 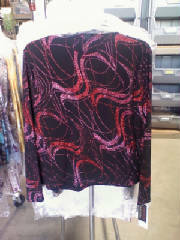 Almost a one of a kind blouse - only 2-4 were made in each size and color!!! Hobby Horse Blue Bayou Blouse, Limited Edition. Get the blues in Blue Bayou–a lovely mix of royal to midnite tones with a lacey overprint and glitter accents stretch fabric for riding comfort. Midnite French cuffs and wing collar are topped with Ultrasuede appliqué and Swarovski crystals for additional shimmer and shine. Poly/lycra, hand wash. Originally $189. Hobby Horse is sold out of this discontinued item! All Hobby Horse photos copyright Hobby Horse Clothing Company. 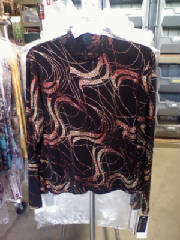 Hobby Horse Autumn Blouse, Limited Edition. Fall for beauty in this elegant, subtle show blouse. Stretch sand fabric is covered with a carpet of fallen leaves in chocolate, black, and whiskey, all aglow with tiny silver sequins. Collar and French cuffs repeat the leaf motif with filigree Ultrasuede appliqués topped with arching sprays of Swarovski crystals and nailheads. Poly/Lycra, hand wash. Originally $189. Copyright Hobby Horse Clothing Company. Hobby Horse Brazil Blouse in Red, Limited Edition. Daring in design and dramatic in impression, the Brazil dances with color and shimmering highlights. Comfortable stretch fabric is printed in a red, black, and silver tropical motif, then covered with tiny silver sequins for non-stop shine indoors or in the sun. Edged in sand satin that’s styled into a bold Diva collar with lapels, Brazil also features satin French cuffs. Colored, clear, and AB Swarovski crystals march along collar and cuffs to emphasize this blouse’s strong lines and elegance. Poly/Lycra, hand wash. USA. Originally $169. Hobby Horse Feather Blouse, Limited Edition - ON SALE!!! Hobby Horse Feather Blouse, Limited Edition. Rich and regal, the Feather Limited Edition show blouse features an intriguing peacock feather motif in shades of teal, green, and midnite blue. New notched lapel and French cuffs in satin are richly accented with shimmering Swarovski crystals. Poly, dry clean. Originally $159. Hobby Horse Las Cruces Blouse, Limited Edition in Sand. Stretch sand fabric has chocolate contrast and golden metallic accent for more shine. Chocolate ultrasuede collar and cuffs are trimmed with double rows of clear Swarovski crystals and gold tone studs for even more sparkle. Originally $159. Hobby Horse Liza Blouse, Limited Edition in Sand. Liza’s diamond theme in print and trim may make it a show gal’s best friend. Stretch sandy fabric has chocolate contrast diamonds, then is covered with tiny sequins for more diamond- like shine. Satiny notched collar and French cuffs are edged with double rows of clear and colored Swarovski crystals for even more sparkle. Poly/Lycra, hand wash. Originally $149. Hobby Horse Sandy Blouse, Limited Edition - ON SALE!!! Hobby Horse Sandy Blouse. Limited Edition. Like seashells on a sandy shore, metallic-edged bands of turquoise and pink wash across Sandy’s stretch bodice in a subtle spiral design that trims your torso. Light glitters off the colorful Swarovski crystals and nailheads on the sand sueded tall Diva collar and French cuffs for extra eye appeal and subtle sophistication. Sandy’s as comfortable as a summer afternoon, and just as lovely. Poly/Lycra, hand wash. USA. Origianlly $149. 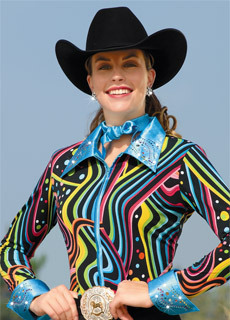 Hobby Horse Shimmy Blouse, Limited Edition. Slimming vertical design. Accented Ultrasuede collar and cuff. Poly/lycra, hand wash. Originally $139. Hobby Horse is sold out of these discontinued blouses! Hobby Horse Tuscany Blouse, Limited Edition ON SALE!!! 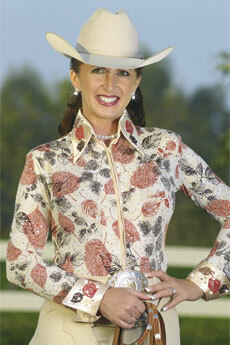 Hobby Horse Tuscany Blouse, Limited Edition. A lovely new color combination of milk chocolate dappled stretch fabric, shot through with delicate vertical golden threads and tiny turquoise accents, makes the Tuscany Limited Edition blouse unforgettable. Tall diva collar and French cuffs, edged with genuine Ultrasuede, are also accented with shimmering Swarovski crystals and nailheads. Poly, hand wash. Originally $169. Hobby Horse Zootopia Blouse, Limited Edition. Exotic colors and patterns distinguish Zootopia from the rest of the pack- its no ordinary animal print! Subtle wildlife design is accented with shaded bands of bright color, then topped by tiny silver sequins for an overall shimmer that draws attention to your ride. Black Diva collar and French cuffs are studded with shaped and colored Swarovski crystals and nailheads to complete this memorable blouse. Zootopia combines colors that flatter most any horse—a fun way to add visual interest to sedate black outfits. Poly/Lycra, hand wash. USA. Originally $149. Bold colors, you said? Find them all here in abundance, with a treasure trove of Swarovski stones and nailheads in brilliant hues studding the turquoise collar and cuffs. This stretchy black-based blouse has ribbons of vivid colors in an abstract design that's as beautiful from across the arena as it is close up-slenderizing, too. Poly/Lycra, hand wash. Originally $169.